Dear Anne I took the decision 15 days ago to come to the Symposium in Columbia but 5 days ago i had a problem to resolve in November In France and i will not be able to come this time. I consider as an honor to be invited by you and the Symposium and i regret of not being in America for speaking about the vaillant African American troops and their chief , my great grand father. I regret also not being here in such an historical moment for African American Community and the world itsel. In Conclusion i would like you tell the conviction of the great grand son of Mariano who admire the bravery of those troops . Henri Goybet , Grandson of General Goybet who commanded black troops to freedom the nations in the World War. 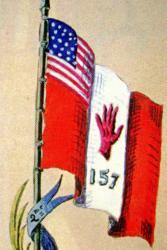 Signed : Henri Goybet Great Grand son of the general goybet commanding the 157th Red Hand Division. 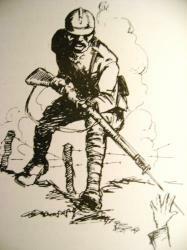 On Saturday, November 15th, the museum hosted a WWI military history symposium. The day-long event featured guest lecturers Lt. Colonel (Ret) Robert L. Brown, Les Jensen and Dr. Mitch Yockelson. Robert Brown, Adjunct Professor at USC Sumter, spoke on the WWI experiences of his grandfather, Robert T. Brown, as well as aviaton superstitions. Les Jensen, Curator of Arms and Armour at the West Point Museum, US Military Academy, gave the lecture, "To Create an Army - Uniforms & Equipment of the AEF in World World One." Dr. Yockelson, Professor at the Naval Academy and Archivist at the National Archives, spoke on the "Borrowed Soldiers of the 30th Division." W. Joe Long, (Relic Room Curator of Education) spoke on WWI aviation, with his presentation, "Iron Men and Canvas Wings: SC Aviators in the Great War." Sarah W. Garrod (Relic Room Chief Curator) presented, "How They Became Pershing's Own: Military Bands in WWI." Anne Clarkson did a special reading sent to her from Henri Goybet, great-grandson of the General Mariano Goybet, Commander of the 157th French "Red Hand" Division. 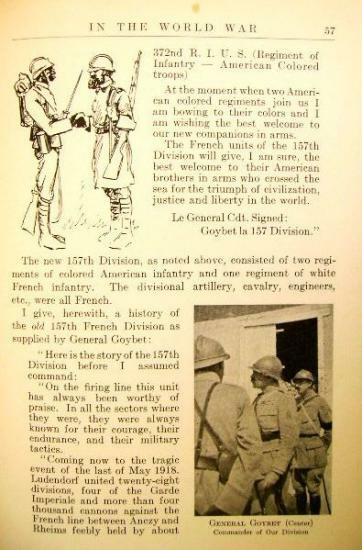 SC's 371st Infantry Regiment served under the 157th French Division. The day included presentations from WWI living historians. Bruce Cotner did a lively impression of a local contractor hired to help build Camp Jackson, located here in Columbia (now Fort Jackson). Dane Coffman did a wonderful impression of General John Pershing. Jeffrey Mosser did a great job with his AEF doughboy impression. Jay Callaham delighted folks with his MP impression and 30th Division collection. Dr. Yockelson hosted a booksigning after the lectures. The event was a big success! The museum sincerely thanks the guest speakers and living historians for their time and expertise. The Relic Room also appreciates the numerous attendees for sharing the day with us and WWI history! Copyright © 2009 S.C. Confederate Relic Room and Military Museum. All rights reserved. The Symposium went well and you were missed very much! Hello my brother, well I thought I would tell you how things went today at the museum. First of all they had a special table set up in the main area just for me and my guest and my military display. I got to sit there for the entire function, right up front where I could see everything. After the introductions I was invited up to read your letter to a large crowd of military history enthusiast and museum curators. I discovered later that many of them came to the Symposium when they discovered that I would be there with the Red Hand Flag. Before I read the letter, I told them about you and your Great Grand father, how I met you and how your Great Grand father was the commander of troop in WWI. I explained what a wonderful person you are and what an honor it was to have a letter from you. Then I read the letter. Everyone there was VERY impressed and moved by both the words of your Great Grand father and the words that you added at the bottom of your note. There was a moment of quiet after I finished the letter then they all applauded! After my reading there was a 15 minute break and almost everyone in the room came to my table where the flag was to thank me for reading the letter, to ask for copies of the letter and to see the flag. I met one young lady who had decided to write her college thesis on World War I from the French perspective after hearing about your Great Grand Father and she would like to have your email address if that is okay with you <g>. Apparently, you are a very popular and important man here in South Carolina and the people at the museum were really honored to have received the letter and would have LOVED to have met you. So you and your Great Grand Father are again heroes in the eyes of the people of South Carolina, or at least the ones I met today. I will have to keep my eyes open to see if there are any articles in the paper about this .